Registration links can be sent to service partners from the Marketplace app. The prospective service partner will then receive a link which will redirect to a partner registration dialog. The first step is creating an account for the service partner with login information. 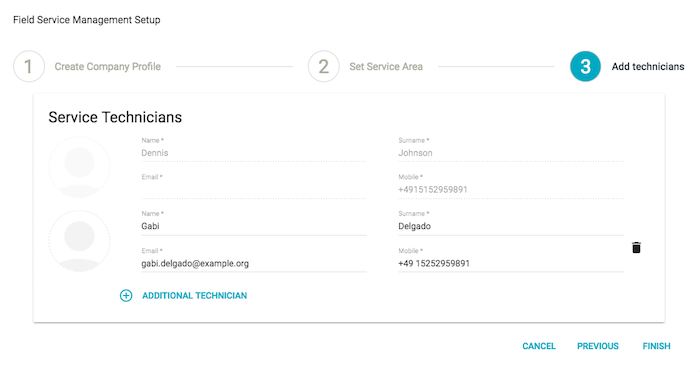 Next, you can create your company profile and enter company information, define the service area, and add technicians. 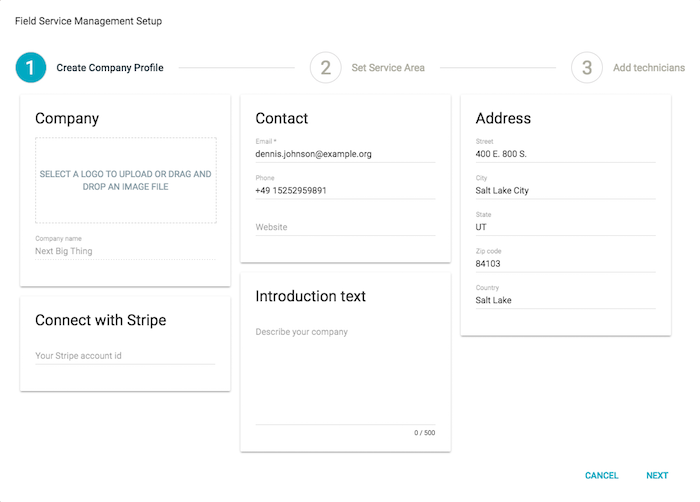 After completing your company profile, you can then create a connection with the company that sent you a registration link, add skills to technicians, and select the relevant service package/s. First Name Required. The first name of the primary service partner contact. Last Name Required. The last name of the primary service partner contact. Phone Required. The service partner phone number. Email The service partner email address. 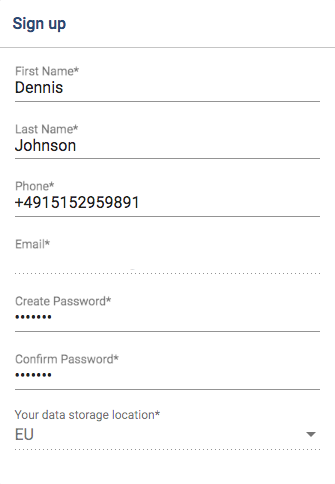 This field is populated with the email address to which the invitation was sent. Create Password Required. Enter a password for the account. Confirm Password Required. Confirm the account password. Your Data Storage Location Select the applicable location in which data will be stored. Account Name Required. The name of the account. 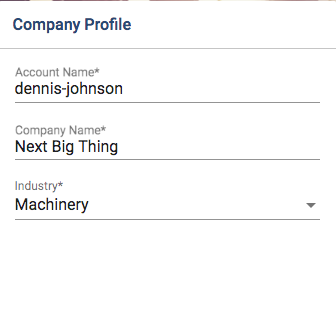 This name will be used to sign into the application to update and append company profile information. Company Name Required. The name of the service partner company. Industry Required. The industry with which the service partner is associated (example: machinery). Select Logo Here, you can add drag and drop or select an image from your computer to be associated with your profile. Company Name This field is populated with the name entered in the previous screen. Your Stripe ID If applicable, your Stripe ID. Stripe is used for payment processing and handling application. Email Required. The email associated with the service partner account. Phone The phone number associated with the service partner account. Website The website associated with the service partner. Describe Your Company Here you can enter a description of your company. Street The street on which the company is located. State The state in which the company is located. Zip Code The company ZIP code. County The county in which the company is located. Area Required. 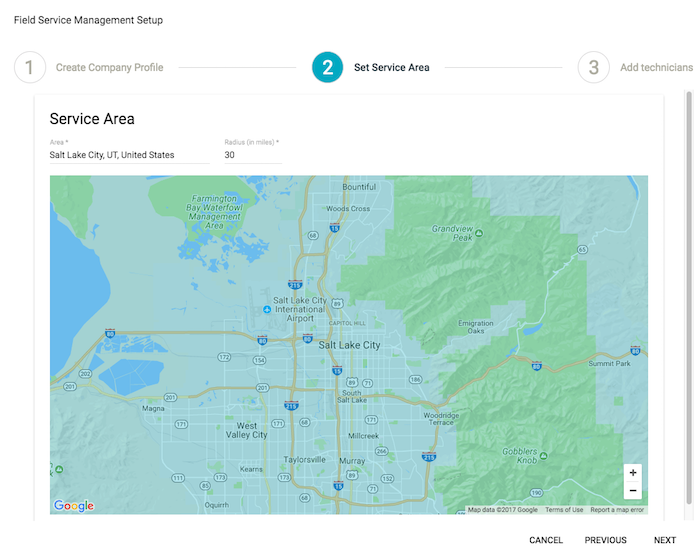 The city area in which the service partner is located/operates. Radius (in miles) The radius in which the service partner operates (example: 20 miles). Note: The first technician record is populated with the account holder information entered in previous steps. Name Required. The first name of the technician. Surname Required. The last name of the technician. Email Required. The email of the technician. Mobile Required. The mobile phone of the technician. Attention In order to complete the collaboration and connect to the company that provided you a registration link, you must agree to the terms and conditions. 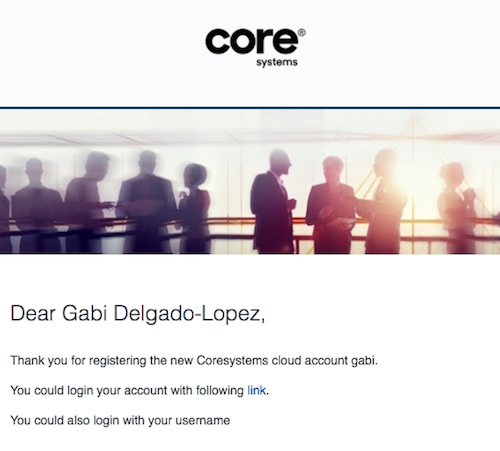 After completing the registration and company profile creation steps, you will now be able to connect to the partner that provided the registration link in order. In this step, you will be able to associate available skills with the technicians you created in the previous step. These skills are managed in the Skills tab of the Workforce Management app. After adding all relevant skills to technicians, you can then select the Add Skills button. Next, you will select the relevant service package/s for the services offered by your company. These service packages are created and managed in the Master Data Management app. After you’ve completed the above steps, you will then receive a confirmation email containing a link to the Planning Board used by the crowd service partner to plan and release assignments, and the user name with which you can login.